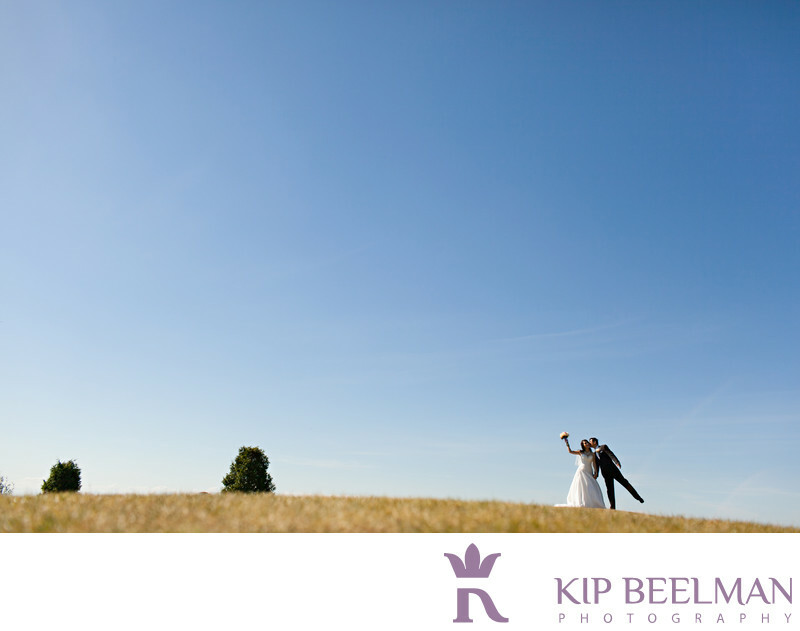 “Blue skies smiling at me, nothin' but blue skies do I see…” Wedding photography at the Golf Club at Newcastle located in Newcastle, Washington allowed for these incredible vistas, vantage points and views. This couple also had a unique wedding day timeline: They were married in an 11 a.m. ceremony which was followed by a wedding lunch, and then we took portraits around the facility, which is known as the Puget Sound’s premier golf and event destination. Located about 40 miles from Seattle, the property featured incredible panoramic views of Lake Washington, Mt. Rainer, the Olympic and Cascade Mountains, and the Seattle skyline. We took full advantage of the scenery and the beautiful sights to see, enjoying spectacular outdoor and indoor Golf Club at Newcastle wedding photography. A storybook wedding location, the first-class golf club facility offers an English manor-style clubhouse as well as an elegant bridal suite, personal attendants and these original, breathtaking spots for photos. It provides an ideal combination of service and scenery as well as indoor and outdoor options for a wedding ceremony and receptions. Location: 15500 6 Penny Ln, Newcastle, WA 98059. Keywords: Golf & Country Club Wedding (9), Newcastle (3), Newcastle Golf Club (3).